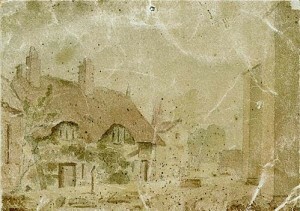 Thomas Dawkes, parish clerk of the original All Saints church during the early nineteenth century was a close neighbour of Benjamin Satchwell and witnessed first hand the metamorphosis of Leamington from a small village into a town. His real importance to the researcher lies in the fact that he made copious notes on what he had personally witnessed. In addition to his long and dedicated service to the church and value as a chronicler one further enigmatic question remains: could Thomas himself, or one of his relatives, have been the fabled eighteenth century “Dawkes the dipper” of the spa? Thomas Dawkes came from a family of local weavers and farmers, stretching back to his great great grandfather Alexander, who farmed in Lillington. 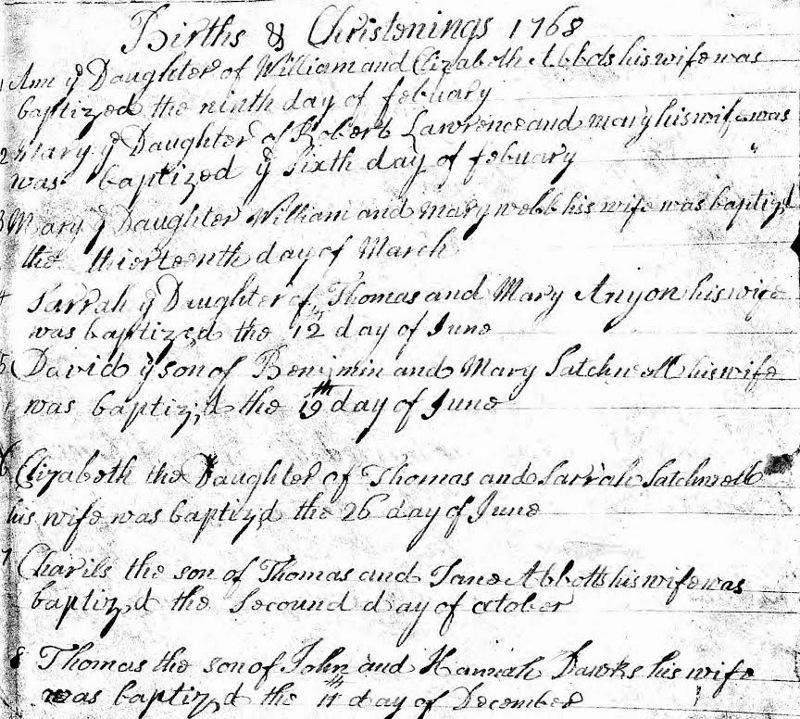 He was born in 1768 and baptised on 17th December at All Saints, the eldest of five known children of the weaver John Dawkes (1746 – 1785) and his wife Hannah née Spires (1745-1812). 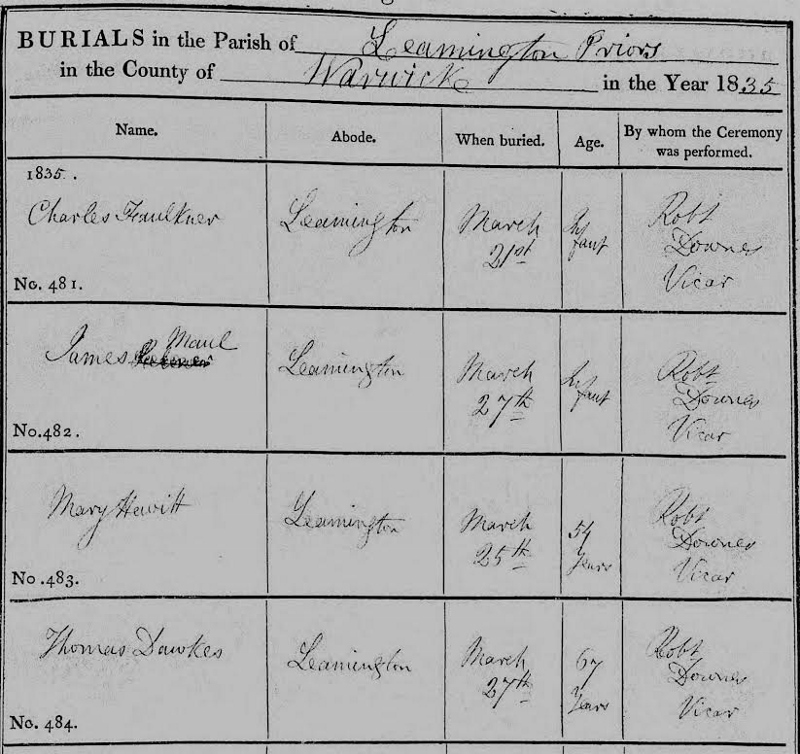 Thomas was married on 10th July 1793 by John Wise the vicar of Leamington, to Mary Paine or Payne. 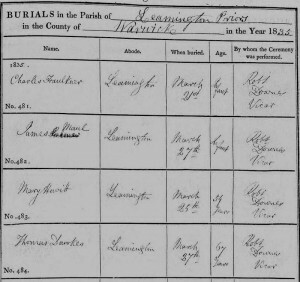 Of their seven children, two, Hannah (1801-10) and Daniel (1809-10) died in childhood but the other five, John, born in 1794, Elizabeth (1796), Thomas (1799), William (1804), and Amy (1806) all reached adulthood and each played a role in the development of the burgeoning town. 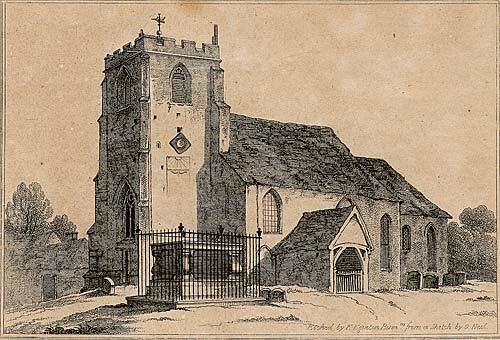 In about 1796, whilst still in his twenties, Thomas became parish clerk of the small village church of All Saints, a post he held until his death. The parish clerk was generally chosen by the vicar, a respected member of the local lay community who led the singing of hymns and assisted with the administration of the church. A “List of pew holders A.D. 1800” published by the Leamington Courier in the latter half of the nineteenth century confirmed that Thomas Dawkes (named wrongly as “John Dawkes”) had a desk in the church (a widespread practice amongst parish clerks at the time) as well as a rented pew. Thomas also rang the church bells, assisted by his three sons John, William and Thomas. 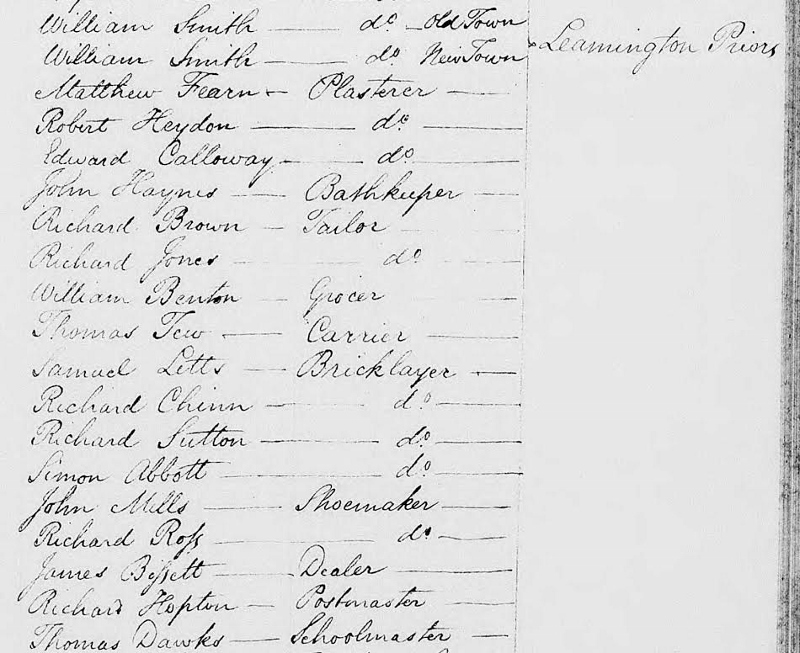 He was also named in the 1821 juror’s lists for Leamington as a schoolmaster, indicating that although the post of parish clerk was a paid one, the income alone would not have been enough to support a family. Leamington’s growth during the period that Thomas held office was exponential: In 1801 the first census shows the population of Leamington to be a mere 315 with a grand total of 65 houses in the village whilst a decade later this had risen to 543, 2183 in 1821, 6269 in1831 and 12812 in 1841. The seeds for this rapid growth were sown by Benjamin Satchwell and William Abbotts’ discovery of the new spring in 1784, which was exploited to great effect for its supposed medicinal qualities and ultimately led over the next fifty years to Leamington’s popularity as a Spa town rivalling that of Cheltenham and Bath. Thomas died on March 24 1835 at the age of 67. His funeral three days later was conducted by the vicar Robert Downes, fittingly at his beloved All Saints where he had held office for over 38 years. Thomas was survived by his wife Mary who died after a lingering illness in November 1842, and his five children – who each inherited a fifth share of the family cottage. Less than a decade after Thomas’s death the first stone for the construction of the new All Saints church was laid, and, perhaps fittingly, at least part of that building work was entrusted to his son-in-law James Brown, who had succeeded him as parish clerk. Thomas Dawkes bequeathed the town a lasting legacy: his son John was both a builder and carpenter. William was also in the building trade, and his son, also William, became the noted builder, undertaker, councillor, parish clerk, churchwarden, local historian and sanitary surveyor based in Radford Road. His daughter Elizabeth dedicated over half a century of her life to the service of All Saints as a pew opener, and Isaac Bloomfield, her husband and a veteran of the Napoleonic wars, became the town’s first recognised postman in 1817. (They are commemorated at All Saints in a marble memorial, proposed by John Craig after Elizabeth’s death aged 80 in 1867.) Their son Edwin Isaac Bloomfield was a teacher who succeeded to the parish clerkship on the death of James Brown in 1854. Thus a member of the Dawkes family held the parish clerkship of All Saints and St Mary’s for all but the final two years of the nineteenth century. One question remains: was Thomas Dawkes in fact, the regular “dipper” of local legend, employed to dip people in the original mineral spring to relieve them of their ailments? In 1818 W T Moncrieff, in “The Visitors New Guide to the Spa of Leamington Priors” noted that whilst the beneficial qualities of the original spring had already been noted in Leamington’s early history, “a regular dipper, Thomas Dilkes” …. [had] been engaged from the beginning of the eighteenth century”. 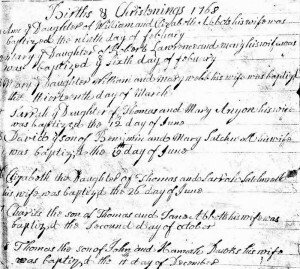 Moncrieff furthermore notes “an annual register was kept, attested by the dipper on oath, that from June 1776 to 1786…no fewer than 119 persons, who had suffered from the bite of mad dogs, had been effectively cured by immersion in the water…” – the legend of Dilkes/Dawkes the Dipper was born. At the turn of the twentieth century, the Leamington Spa Courier published a series of fascinating articles entitled “Glimpses of Leamington Life and Reminisces of an old Leamingtonian.” An article from 1913 describes the late Councillor William Dawkes, himself a noted contemporary authority on the town’s history, as “grandson of the original dipper”. T B Dudley, furthermore, writes as follows “the name of Thomas Dilkes does not appear in any of the registers, and Thomas Dawkes makes no allusion in his memoranda either to Dilkes or the dipping process. It has been thought that Dawkes himself was the “regular dipper”, and that the name of Dilkes is a printer’s error. Considering that he resided close to the spring, the theory is not improbable”. Lyndon F Cave, writing almost a century later in his 1988 work “Royal Leamington Spa: its history and development” repeats the assertion. However, Thomas Dawkes would have been just sixteen when the the new spring was found by Satchwell and Abbotts in 1784 and would have been far too young to have been the dipper who supposedly kept a list of over 100 “cures” effected by the old spring between 1778 and 1784. If Thomas the parish clerk is not to be identified as “Dawkes the dipper” then who can lay claim to this mantle? 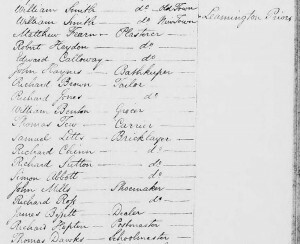 Research confirms Dudley’s suggestion that the name Dilkes does not appear in the Leamington parish register or, indeed, in a wider search of local villages and Warwickshire. 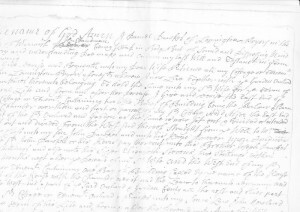 The most likely candidate would appear to be Thomas the step-brother of the clerk’s grandfather John: baptised in Leamington on 15 December 1680, the son of Daniel Dawkes, this Thomas Dawkes would have grown up in the Dawkes’ family cottage adjacent to the churchyard and, if as Moncrieff’s asserts, a dipper was employed “from the beginning of the eighteenth century,” he presents a strong case. 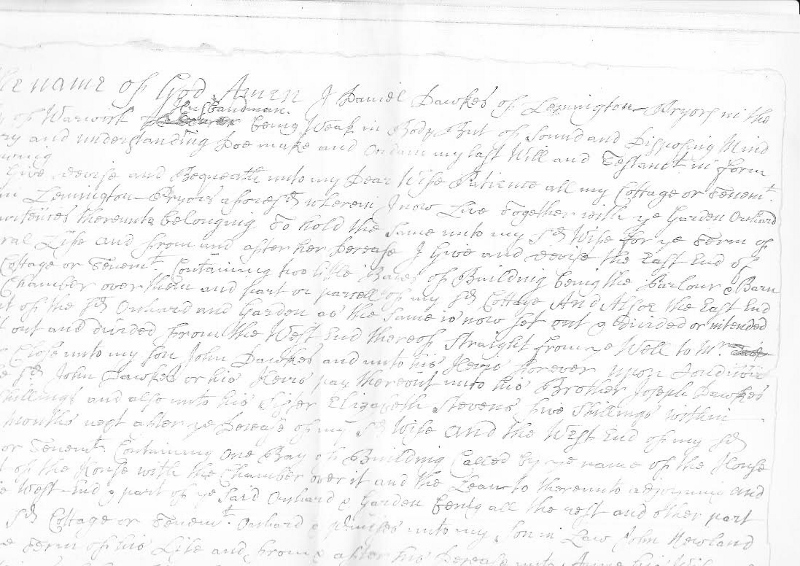 Interestingly, the will of Daniel Dawkes (d 1728) gives his wishes for his property to be split into two: the West half to his son John “next to ye well” and the other half to John Newland, husband of his daughter Anne. Is this “well” the fabled “old spring”? If so it was situated alongside the cottages of the Dawkes family. Regardless of whether Thomas Dawkes or a member of his family is to be associated with the fabled dipper of the old spring, he nonetheless proved a faithful servant to All Saints church for almost four decades and achieved note as a chronicler whose relatives in their turn were to serve the town well. The modern historian of Leamington when asked the proverbial question as to whom they would like to invite to dinner, could do a good deal worse than Thomas Dawkes.